This post is the first of a five-part series on the history of our wars with the Mihši-maalhsaki (Americans), which occurred from 1778-1794 and from 1812-1814. This first article provides some background to the wars and a brief overview of what readers will find in parts 2-5. I started planning this series of posts on the Mihši-maalhsa Wars this past summer (2013). As I sat down to work on the outline one evening in early July, the distant booming of fireworks could be heard through my open windows. One of the communities to the north of Oxford, Ohio was putting on their Fourth of July fireworks show. I was reminded, in that moment, that the celebrations around the Fourth mean very different things to different people. For the majority of Americans, the fireworks celebrate the proclamation of the Declaration of Independence, a key moment in the transformation of thirteen separate colonies into one independent nation. This transformation set the stage for the eventual expansion of the United States from the Atlantic coast to the Pacific Ocean. For many, it is also a time to celebrate the present accomplishments and current values of the United States. As a lover of all kinds of history, I am aware that over time the Declaration of Independence became a critically important document to many peoples around the world. The political and social ideals laid out on that piece of parchment were truly revolutionary. Yet over 200 years after its formal signing, the revolution remains incomplete. 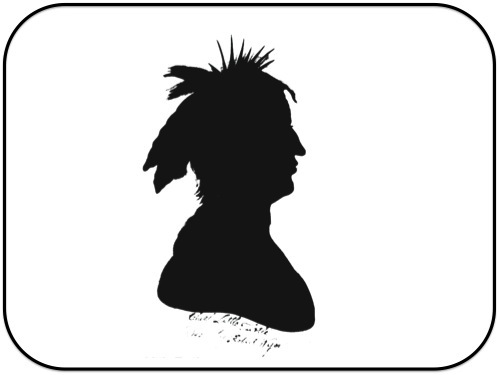 Mihšihkinaahkwa was a key Myaamia leader during the Mihši-maalhsa Wars.This silhouette was reportedly made of Mihšihkinaahkwa at some point during the 1790s. In the years that followed the Declaration, this revolution excluded African-Americans, most of whom were enslaved, all women, and most poor men. This revolution also came at the direct expense our Myaamia ancestors. The words proclaimed in the village squares in the summer of 1776, set into motion a series of events that eventually placed tribal communities and the newly born American state into direct violent conflict with each other. For Myaamia people, the Fourth of July marks the beginning point of multiple invasions of our people’s homelands and the start of one of the worst periods of decline in our history. I see myself as a full citizen of the Miami Tribe of Oklahoma and a full citizen of the United States. In some ways this dual status is comfortable and in other ways it is challenging and painful. Niila myaamia eeyaakwaamisiaani, kati nahi-mihtohseenia (I am Myaamia and I strive to live as a proper human being), and I also have respect and love for many of the institutions and cultural practices of the United States. Three generations of my ancestors fought against the armies of the United States, and in the two hundred years that followed those wars, at least three generations of my relatives served in the U.S. military. I am proud of all my relatives’ sacrifices, and I would guess that my family’s experience is not unique amongst my Myaamia kin. As a result, I think it’s fair to say that our relationship to the broader American society is at times conflicted. Our earliest interactions with the United States were negative, to say the least, but that does not stop us from carving out a better day for our people in our contemporary lives and hopefully creating a better tomorrow for our extended Myaamia family. Today, many of us believe that the future our tribal nation is not in direct competition with the future of the United States. Our elected leaders work regularly to deal with the conflicts that arise amongst our nations, but most times these conflicts are addressed in a way that recognizes both groups’ right to exist. We have a unique American experience. No matter how painful or ugly some of the chapters of our story, these experiences are a part of who we are as Myaamiaki. In many ways we have grown used to our conflicted status and we do not talk about it very often. However, at certain moments, we are jarringly forced to acknowledge that our experiences and our stories are different from many of our neighbors in significant ways. The story of the Mihši-maalhsa Wars is not an easy one for me to research or to retell, but it is vitally necessary that we understand these conflicts. I am not one for lingering over painful memories, but to forget them would be a terrible fate. We need to remember and reflect on all our stories as we continue to work to rebuild a thriving tribal nation. Some of the roots of our nation spring out of the intense violence of our wars with the Americans, and this tragic and unfortunate reality has an impact on our people today. Prior to the American Revolutionary War, Myaamia people developed a relationship based on trade with two distinct groups of British colonists: Pennsylvanians and Virginians. These colonies contained various ethnic groups: German, Irish, Scottish, English, and enslaved peoples descended from various African tribal groups. 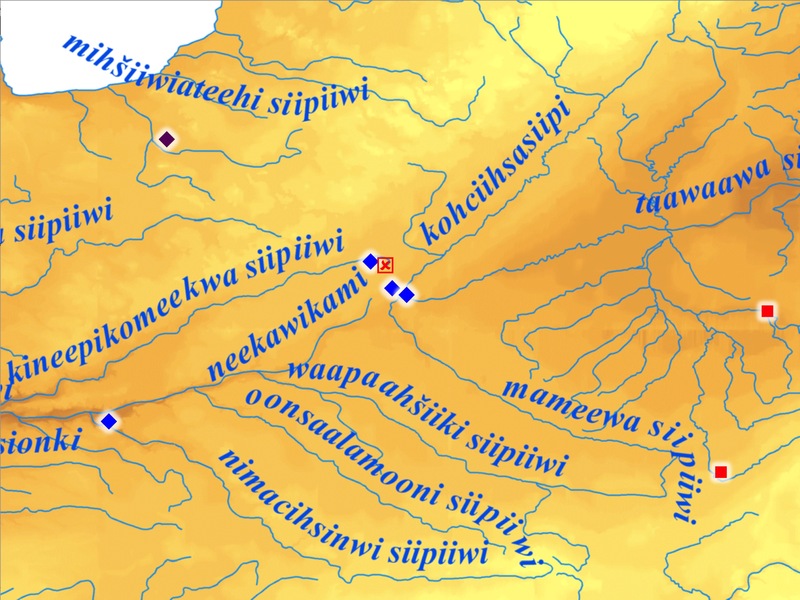 All of the major villages of the Waapaahšiki Siipiiwi engaged in trade and exchange with the British colonists during this period. Trade peaked during the years of the Pinkwaawilenionki village (1747-1752) and declined during the French and Indian War (1755-1763), as some Myaamia men fought against the British. Following the British victory over France in 1763, all of the French subjects living throughout North America were forced to become British subjects. Shortly after the British victory, conflict erupted between the British and many of the tribal groups of the Great Lakes. Some Myaamia participated in attacks on the British, and some chose neutrality. For our neighbors and relatives living east of the Scioto River, the violence of this period led to significant loss of life and forced relocation. By comparison, life in the upper Wabash River Valley was relatively calm. After 1764, Myaamia villages had limited direct contact with the British government or its colonists. The early years of the American War for Independence were a “non-event” for Myaamia villages in the Wabash River Valley. Tribes living to our east, however, did become embroiled in the conflict in its early years (1775-1778). In some cases the war divided related groups. For example, some Haudenosaunee sided with the Thirteen Colonies and some with the British. In these early years, the colonists were extremely interested in forging alliances with tribal peoples and even officially invited the Delaware and Cherokee to send a delegate to the Continental Congress. However, the flames of war eventually spread to the Ohio and Wabash River Valleys. Border conflicts increased in intensity over the hunting grounds along the Ohio River into Kentucky. The war eventually opened the floodgates to Virginian migration into Kentucky. Prior to the war, the British had tried to block settlement west of the Appalachian Mountains, but following the Declaration of Independence this control vanished. In addition, the Thirteen Colonies felt increasingly secure following a major victory at Saratoga in 1777 and the official entry of France into the war against Great Britain in 1778. As a result, the Americans, Virginians especially, became more aggressive in their treatment of native peoples. In July of 1778, George Rogers Clark led approximately 180 Virginia militiamen west along the Ohio River and then overland to the banks of the Mississippi. Clark captured the French and Inoka (Illinois) villages of Kaskaskia and Cahokia and then sent a second body of troops to capture the British fort at Vincennes. The goal of Clark’s campaign was to put a stop to the attacks on Americans who had moved into Kentucky. He hoped to eventually launch an assault on the British fort at Detroit, which many saw as the ultimate source of the raids. The Virginians living in Kentucky occupied the shared hunting grounds of the tribes of the Ohio and Wabash River Valleys. Clark was a Virginian and had invested in land in Kentucky. He had family and friends among these migrants, and he also saw some of the squatters as potential customers. In attempting to stop the raids, Clark was defending his friends and family and protecting his investments. But for Myaamia people, the Mihši-maalhsaki were squatting on shared hunting grounds, lands to which they had no rights. The initial invasion of Vincennes ended in retreat and Clark led a second campaign in February 1779 that recaptured the fort and the British Lieutenant-Governor of Detroit, Henry Hamilton. In this second invasion, Clark was assisted by men from the Inoka (Illinois) villages and received offers of aid from the Peeyankihšia. In contrast, Hamilton was aided by the Myaamia leaders Pakaana and Le Gris and men from the Kiihkayonki area villages. In 1778-79, Myaamia people were clearly divided over their response to the Mihši-maalhsa. This division and uncertainty would change very quickly in the following years. These homelands and hunting grounds belonged to Native peoples: Shawnee, Delaware, Haudenosaunee, Wyandot, and Miami just to name a few. The Americans recognized their own legal title was tentative at best. Prior to the American Revolution, the British claimed title to all the lands east of the Mississippi because they had defeated the French in 1763. Native peoples never recognized this claim, but it had lasting implications none-the-less. This map depicts the first two American invasions of Myaamionki. The first, Clark’s Campaign is marked by the black dotted line. The second, La Balme’s Raid, is marked with a blue dotted line. Base map by Joshua Sutterfield. In the summer of 1780, a French cavalry officer named Augustine Mottin de La Balme arrived in Kaskaskia to recruit French Americans and local tribal peoples in an attack on British Detroit. At this point in the Revolutionary War, France had officially declared war on Great Britain and was sending military aid to the American colonial war effort. La Balme claimed to be in the Illinois Country on orders from the Continental Congress, but most of the evidence indicates that he was essentially acting on his own. He had grand hopes of drawing large numbers of French inhabitants of lower Great Lakes to the American cause. La Balme did convince sixty to eighty French and Native horsemen to join his campaign and they moved up the Wabash and attacked and plundered the British allied trading posts at Kiihkayonki and a significant part of the Myaamia village. After twelve days of looting the village, a large Myaamia hunting party returned home and La Balme’s force quickly withdrew and encamped on the Kineepikomeekwa Siipiiwi (Eel River) to the west of Kiihkayonki. On November 5, a Myaamia war party under the leadership of Mihšihkinaahkwa (Little Turtle) attacked La Balme’s camp. By the end of the battle, the Myaamia had killed half of La Balme’s force, including La Balme himself. The other half was either captured or fled into the nearby woods. One of the outcomes of La Balme’s failed campaign was to push most of the Myaamia villages into the anti-American camp. 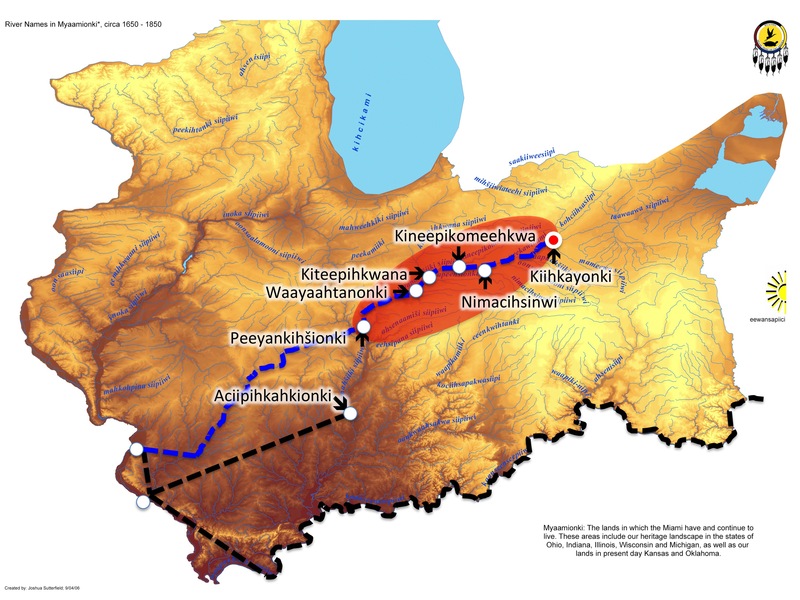 For the rest of the Revolutionary War, the Myaamia actively assisted allied tribes in attacking the Mihši-maalhsa settlements along the Ohio River. In the early 1780s, violence throughout the Ohio River valley increased in intensity as Shawnee, Delaware, and Haudenosaunee villages were repeatedly attacked and burned and Kentucky settlements were assaulted in reprisal raids. The red x marks the location of the Myaamia victory over La Balme in 1780. In 1780, most of the villages in the area were Myaamia (blue diamonds) with Kiihkayonki and Miami Town at the confluence of the Taawaawa Siipiiwi (Maumee River), Turtletown to the west on the Kineepikomeehkwa Siipiiwi (Eel River), and the Mississinewa Village on the Nimacihsinwi Siipiiwi (Mississinewa River). The Myaamia-Potawatomi village on the Mihšiiwiateehi Siipiiwi (Elkhart River, purple diamond). To the east in the Auglaize watershed were two Ottawa villages (red squares). This situation changed radically in the 1780s as multiple groups from the east relocated to Wabash, Maumee, and Auglaize River Valleys in order to find shelter and join together against the invading Mihši-maalhsa. Base map by Joshua Sutterfield. Following the conclusion of the American Revolution and the official Treaty of Paris in 1783, the British transferred their fictitious title to all the lands east of the Mississippi, except Canada and Florida, to the newly “free” American colonies. The Americans quickly sought to secure this tenuous title by attempting to put an end to the violence along the Ohio River and negotiate new treaties with various tribal groups in order to legitimize American ownership of these lands. In the treaties of Ft. Stanwix (1784), Ft. McIntosh (1785), and Ft. Finney (1786) the Americans informed participants that the British had passed ownership of their lands to the United States, and using strong-arm tactics and alcohol forced representatives to recognize this invented title and relinquish their rights to varying amounts of land. Myaamia village leaders refused to attend any of these negotiations, and most other tribal groups refused to recognize the results of any of the above treaties. As a result, the Americans continued to feel insecure about the status of the lands they believed they needed for financial, political, and social reasons. Increasingly, the Americans began to threaten all the tribes with war if they did not negotiate with the United States. The weak status of American claims to lands along the Ohio River coupled with the failure of the groups to come together in meaningful negotiations set the stage for the Mihši-maalhsa Wars. Unfortunately these factors also set the tone for how Native peoples would be treated by this newborn nation, the United States of America. For Myaamia people, this group of European descendants was decidedly different. Never before had the French or the British asked our people to cede control of land. In the 150 years since we first encountered the French there were numerous cases of violence and conflict, but there always seemed to be a path through which we could live in relative peace. Over the 1780s, as refugees from allied tribes poured out of the Ohio country it became increasingly clear that the Mihši-maalhsaki were going to be an altogether different kind of neighbor. In part two of this series, we will look at the Battle for Kiihkayonki in 1790, which is also known as Harmar’s Defeat. The history of this battle highlights how the allied tribes effectively joined together in order to successfully defeat an American army. In addition, this article will look at the terrible consequences that came even with victory. In part three, we will examine the Battle of the Wabash in 1791, also known as St. Clair’s Defeat. This remains one of the largest defeats of the U.S. Army to date and marks the highpoint of the inter-tribal alliance centered along the Maumee River Valley. In the second to last installment of this series, we will explore the defeat of the inter-tribal alliance at the Battle of Fallen Timbers in 1794 and look at how all parties attempted to establish a lasting peace at the first Treaty of Greenville in 1795. This peace is significant for Myaamia people because it is the first peace agreement that required us to give up land. Later next year, we will return to this theme as we look at our last war with the Mihši-maalhsa: the War of 1812. This war was a major point of transition for the emerging Miami Nation and gave birth to a “Third Path” of resistance to United States efforts to diminish and forcibly remove tribes west of the Mississippi. If you would like to comment on this story, ask general historical questions, or request a future article on a different topic, then please visit our Myaamia Community History and Ecology Blog at:https://myaamiahistory.wordpress.com. This blog is a place for our community to gather together to read, learn, and discuss our history and ecology. Our history belongs to all of us and I hope we can use this blog as one place to further our knowledge and or strengthen connections to our shared past. On limited contact between Miami and British after 1764 see Richard White, The Middle Ground: Indians, Empires, and Republics in the Great Lakes Region, 1650-1815, Cambridge Studies in North American Indian History. (Cambridge; New York: Cambridge University Press, 1991), 373. White adds that much of the support for the British was purely focused on keeping the Americans out of Kentucky, ibid, 367. Birzer successfully demonstrates that the Myaamia attack on La Balme’s pro-American force was really a result of the connections to Charles Beaubien and not the result of intense pro-British sentiment. Bradley J. Birzer, “French Imperial remnants on the Middle Ground: The Strange Case of August de la Balme and Charles Beaubien,” Journal of the Illinois State Historical Society, vol. 93, No. 2 (Summer 2000), 148. Raymond D. Fogelson, “The Ethnohistory of Events and Nonevents,” Ethnohistory, Vol. 36, No. 2 (Spring 1989), 133-147. Vine Deloria, “Self-determination and the Concept of Sovereignty,” in Economic Developments in American Indian Reservations, Roxanne Dunbar-Ortiz & Larry Emerson eds., (Albuquerque: Institute for Native American Development, University of New Mexico, 1970), 23. For numbers of settlers post 1783 see Wiley Sword, President Washington’s Indian War: the Struggle for the Old Northwest, 1790-1795 (Norman: University of Oklahoma Press, 1985), 4. For Proclamation of 1763 and the Quebec Act see Harvey Lewis Carter, The Life and Times of Little Turtle: First Sagamore of the Wabash (Urbana: University of Illinois Press, 1987), 54-57. Helen Hornbeck Tanner and Miklos Pinther, Atlas of Great Lakes Indian History (Civilization of the American Indian series; v. 174. 1st ed. Norman: Published for the Newberry Library by the University of Oklahoma Press, 1987), Map 19, 93. White, Middle Ground, 370-72. Sword cites a 40 million dollar debt owed by the United States after the war. Sword, Washington’s War, 4. Bert Anson, The Miami Indians, 1st ed. (Norman: University of Oklahoma Press, 1970), 91. Bradley J. Birzer, “French Imperial remnants on the Middle Ground: The Strange Case of August de la Balme and Charles Beaubien,” Journal of the Illinois State Historical Society, vol. 93, No. 2 (Summer 2000), 146-47. Carter, Little Turtle, 73-75. Cayton highlights American insecurities in his examination of the Treaty of Greenville in Andrew R.L. Cayton, “’Noble Actors’ upon ‘the Theatre of Honour’: Power and Civility in the Treaty of Greenville,” in Andrew R. L. Cayton and Fredrika J. Teute, Contact Points: American Frontiers from the Mohawk Valley to the Mississippi, 1750-1830. (Chapel Hill: University of North Carolina Press, 1998), 239. Sword, Washington’s War, 26, 28-30. Great article. Enjoyed reading it even though, as you say, it is rather bittersweet. I have a question regarding something in your article that I had not heard before. Why, and how, did the British block settlement west of the Appalachians? aya eeweemilaani Scott, this is good question. Following the end of the Seven Years War, the British crown issued the Royal Proclamation of 1763. The Proclamation banned settlement and land purchases west of the the Appalachian mountains (from Florida to Quebec). Most historians believe that the British created this policy to protect natives of the lower Great Lakes from the encroachment of colonial settlers and limit the violence that seemed to inevitably result. In addition, this allowed the British government firmer control of the fur trade and of its colonies who were becoming increasingly difficult to manage. Of course, squatters violated the Proclamation and the line was modified in 1768 to include a swath of western Pennsylvania. But the policy did slow illegal movement into the Ohio River Valley. The quasi-civil war of the American Revolution further delayed the settlement of the Valley. So with the end of the American Revolution the official policy of blocking legal settlement died at the same time that the disrupting factors produced by the war ceased. Settlement increased rapidly after this point. Ironically, the new government of the United States, under both the Articles of Confederation and the Federal Constitution, adopted many of the same attitudes regarding illegal settlement. The major policy shift was in the area of land acquisition. The U.S. actively sought numerous land treaties with tribes of the lower Great Lakes, but they planned to sell this land in an organized fashion to generate revenue. Squatters disrupted these efforts. If you’re interested in reading more about this in a brief summary see Harvey Lewis Carter, The Life and Times of Little Turtle, 54-61. For a more expansive take on this, see Colin Calloway, The Scratch of a Pen: 1763 and the Transformation of North America. Thank you so much for this, George. Your research and writing are so valuable to everyone trying to understand this history. Hello George and thank you for this series. I have done some reading from American writers of that time but prefer your analysis from a tribal member view. I am interested in the Birzer source you used about le Balme and Charles Beaubien pp. 146-147. Would you be able to email me those 2 pages? Charles Beaubien and Tacumwah had Josette (my 6th great grandmother). Very little is known of Mr. Beaubien and I am interested in that article. aya Brooke, iihia I’ll send you something via email. Neewe for reading.